Official: Granbury Tornado Left "Total Devastation"
Destruction in Granbury from an EF-4 tornado on Wednesday, May 15, 2013. 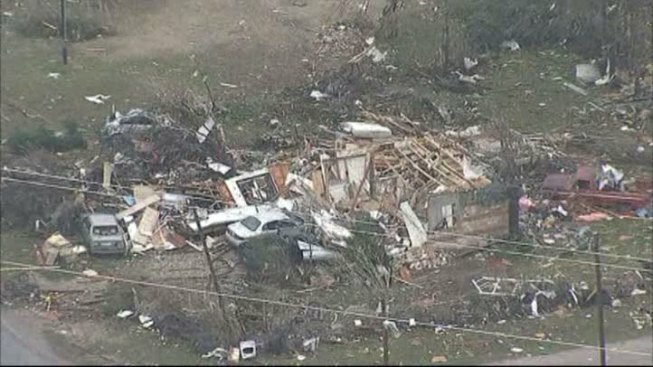 A leader of a North Texas county where six people died in a tornado has described a storm-damaged neighborhood as "total devastation." Hood County Commissioner Steve Berry before dawn Thursday surveyed the damage in Granbury, about 40 miles southwest of Fort Worth. Berry, who was a firefighter for more than 20 years, said the Ranch Brazos neighborhood has about 100 mobile homes and wood structures. He said a lot of the mobile homes were "wadded up" and rolled during Wednesday night's twister. Berry said all of the homes have significant damage and as many as half were destroyed. He said a lot of homes were built by volunteers with Habitat for Humanity. Berry said houses can be rebuilt over time but the loss of a life is devastating to families. On Thursday morning, the National Weather Service rated the strength of the tornado that hit Granbury as an EF-4 with wind speeds between 160 mph and 200 mph.